Mrs. Olson's Lifetime Activities class. Mrs. Olson’s Lifetime Activities class. 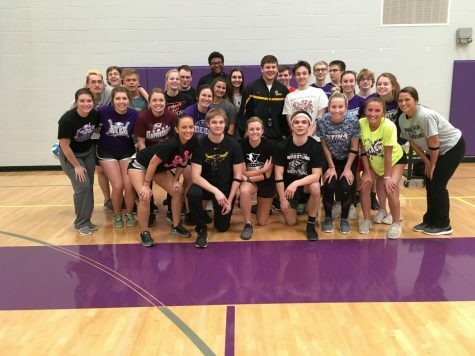 PE teacher Mrs. Olson has announced that she will be heading to a new position next year at Martin Luther College in New Ulm. Mrs. Olson will be teaching Kinesiology and Exercise Physiology. She is excited to teach these classes she said, “because I will get to infuse exercise even more and help show how it benefits the human body.” She will also be an assistant track coach at MLC. Mrs. Olson has been a big part of New Ulm High School. This year she has taught Disease and Disorders, Med Term 1, Med Term 2, Health, and Lifetime Activities. Co-worker Mrs. Longtin says,”Mrs. Olson has been a true asset to the Health/PE department the past 3 years. She has taught almost every class offered in our area including developing curriculum for all of the health science classes. She is passionate about the students at NUHS and will be missed by many.” Mrs. Olson has background in science and health because she started her career in the medical field. However, after a few years in college, Mrs. Olson decided that her true passion was teaching kids. She changed her major to education and took a position at the high school 3 years ago. Mrs. Olson seemed to be a good fit for developing the new medical/science courses. Her students appreciate the background she has in this area. She developed Disease and Disorders and Medical Terminology 1 and 2. Many students really enjoy some of the nontraditional activities that students get to do in the Lifetime Activities classes. Senior Ryan Esser said, “My favorite thing we have done in class is to play wallyball down at Vogel Arena. Mrs. Olson is easy going and fun to joke around with, but everyone respects her.” She also arranges for students to do many other activities such as canoeing, fishing, cross-country skiing, and hiking. This encourages people to continue staying active and healthy even after high school. New Ulm High School will have a hard time replacing Mrs. Olson next year due to the content that she teaches and the fact that students love and respect her.